The Pedigree - this bag is the larger of the two. 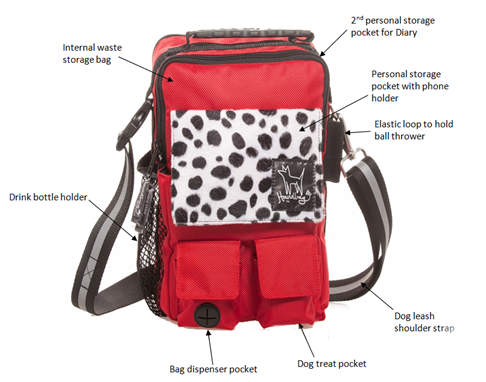 This bag has a drink bottle holder, ball thrower holder, internal phone holder (with clip for keys and headphone output feature), external poo bag dispenser pocket and treat pocket at the front and waste bag storage. There are two zipped compartments big enough to hold an Ipad, book, personal items etc. 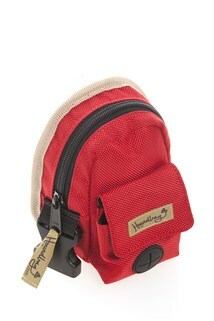 It also comes with a spare lead which can clip onto the bag and also be used as a shoulder strap. The lead has a luminous strip through it for high visibility at night. The Miniature - this bag has the poo bag dispenser pocket at the front, has a belt loop and clip, and a zipped compartment which can be used to store your mobile phone, keys, money etc. Like the bigger bag, the zipped compartment contains a spare lead which clips onto the bag and can also be used as a shoulder strap. The lead has a luminous strip through it for high visibility at night.